Disable them by going to Settings > Notifications and scrolling all the way to the bottom. 1 AM I got a blaring alert that woke me up. About a dust storm. WTH?! 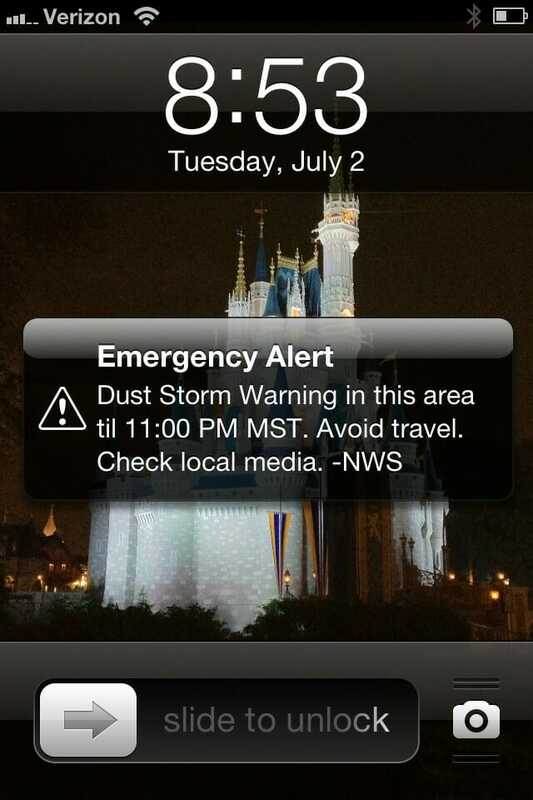 I also got these dust storm warnings. My wife and I both. And it was the third, you're right. But I thought it was related to us both having the AZ Central app. I didn't realize everyone in the area was getting it. Tell you what, that alert is ANNOYING!! If I were sleeping when that went off, I would be pissed. Here's my annoyance: I disabled them, and somehow they re-enabled. Grr. The use of 'til' is grammatically correct in that sentence. Archaic and now nonstandard, but perfectly valid. My wife and I took a cruise in May that departed out of Miami. When our flight to FLL landed, several phones (including mine) did the same thing, for a flash flood watch; the 2nd biggest weather non-event ever. I immediately disabled mine. From March to early July, practically every time I fart there's a tornado watch (Kansas). Flash flood watches are also particularly useless. It rains a lot in the midwest in spring. Duh. And even for tornado warnings, I almost never go to the basement. I've lived 30 years in Kansas and have never seen a tornado in real life. I think Congress is worried that since we seem to be approaching a post-television population that somehow we won't be able to save ourselves from severe weather. Bridgeport, CT uses emergency warning (cell & reverse 911) to remind people on election day to vote early and vote often. The recipients are 99.9% one political party and as they say - the voting's not done until their candidate has won." Buy an unlocked untampered phone like those in the Google store. They don't have the software to do this. Best T-Mobile can do to me is send me a text message and I can block that. Google play store has added G4 and HTC One , in addition to the Nexus 4 to the lineup. Sure you pay full price for the phones bit then you also buy freedom - since the phone company can also not block other features like the hotspot. Yup, under "Government Warnings". I disabled mine this morning. Hopefully David above is wrong, and they won't get re-enabled. way, way, way TOO MANY "emergency" broadcasts that are being categorized by more and more people as chicken-littles that need to be throttled. The likelihood of FCC/whoever in government getting anything right with this is zero. So it is some kind of affirmative action program? Part of the problem is that we are better able to detect weather. In the old days, they would issue a tornado warning if someone actually saw one touch down. Now with Doppler radar, every level 1 tornado - which probably only has the strength to pull a few shingles off an old roof is detected, and the warnings are dutifully issued. Though the standards are local, they might want to change them, to not warn anyone until the wind gets to 100mph. Houses are designed to withstand 120mph winds. I don't think cars fly until the winds get to 100 either. different players at the State and Local level can generate "broadcasts" and it's just gotten out of hand... IMHO. first - the actual "tone" is damned obnoxious... it sends my dog running to hide! second.. they need not only less harsh "tones" but different "tones" for different types of "emergencies" with the strongest most obnoxious saved for ONLY THE MOST DIRE and Immediate threats. I'm not sure this is just a govt thing either as the local Comcast decided to run "tests" almost every morning at 6:30am even when the guidelines call for once a week in the wee am hours. trying to track them down to complain was a challenge and at the end of the day, there was not an incompetent govr employee involved.. just some dunderheads at Comcast. I think I would just turn it off, or root my phone so I could remove the software. I purchased a phone that just has Android on it and none of the other crap the phone companies like to put on, or is now mandated to be put on by the phone companies. Buy a Nexus 4 or one of the other phones from Google play and you shouldn't have the issues at all. Sometimes you have to pay for freedom. While on my annual storm chasing trip to the MidWest this year, mine started doing this - tornado warnings. It was annoying, and it was inconsistent. Many times we were in tornado warned areas with no alert. 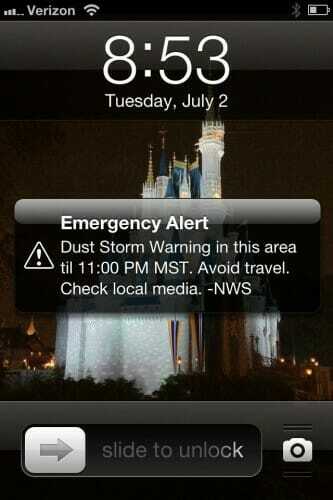 The first time a dust storm alert wakes me up at night, mine gets turned off. Until then, it may be useful when I'm chasing or spotting. What's strange about the need for government sponsorship of the development of this app - several years ago I was able to get an app, put out by my local tv station, that did the exact same thing. Of course *that* one I was able to turn off after I got tired of the constant warnings about excessive temperatures and dust storms - in Phoenix. Though you are supposed to be able to opt out of some of the warnings (somewhere in the settings there's an option) you can not opt out of the "presidentially authorized" ones. Yep, the damn app will deliver emergency messages straight from the president. Though I don't know what he could possibly say that would be useful. Maybe "five minutes ago the Russians launched a massive nuclear first strike aimed at us, bend over and kiss your arse goodbye."? Mine gives alarm clock level beeps at me and blocks use of the phone until I acknowledge it, unlike a regular text. I used to get lots of flood warnings for "my area" even though I was in a highrise in Chicago. Sometimes two or three times the same night. They should've sent me a text warning me that my phone would suddenly emit pointless loud noises, which apparently was a much bigger risk. And when I was a law student I used to get texts, emails and voicemails about emergency stuff at the undergrad campus, which was out in the suburbs far from me. I'd get one text, email, and sometimes robocall that a situation was happening, then again that everybody was evacuated (either some minor electrical issue or false alarm) and a final one that it was safe to return. Leaving me with six or nine cumulative messages about a campus non-emergency for a place I visited exactly once in three years of law school. Because after Virginia Tech, everybody freaked out - why was there no warning for evacuation ?!?! - and nobody wanted to be the guy suggesting moderation in the face of incredibly mild security non-issues. Months or years of millions of people being annoyed by momentary beeps, which I agree are pointless overreaction, will be swamped by the next incident that results in fatalities or has lethal capacity. They'd rather devalue the meaning of alarms and bother huge numbers of people needlessly than get blamed for not warning people. Huge incentives to warn, little or no blowback for over-warning. Because most people want to forget it after it happens. "til" is perfectly good English. "Until" is, too. All that said, I could do without the government notifications. I think this should be done through Network broadcasters! like emergency mass notification software as it is much better way to avoid failures.